Chancellor Kent Syverud today announced the appointment of Amir Rahnamay-Azar as Senior Vice President and Chief Financial Officer at Syracuse University. Reporting to the Chancellor as a member of the executive team, he will direct the university’s finance and administration functions. Rahnamay-Azar’s appointment is effective Feb. 15 and is subject to the approval of the Board of Trustees. Rahnamay-Azar previously served as Chief Financial Officer at Carnegie Mellon University, where he was responsible for strategic leadership of central administrative functions including campus design and facilities development; computing services; budget and financial planning; treasury operations; international finance; controller and audit services; and financial systems. He directed the successful implementation of CMUWorks, a service center for human resources, payroll, business systems transactions and support. Rahnamay-Azar was also responsible for the planning, design, construction and renovation of university facilities, including more than $350 million in capital projects involving campus facilities. 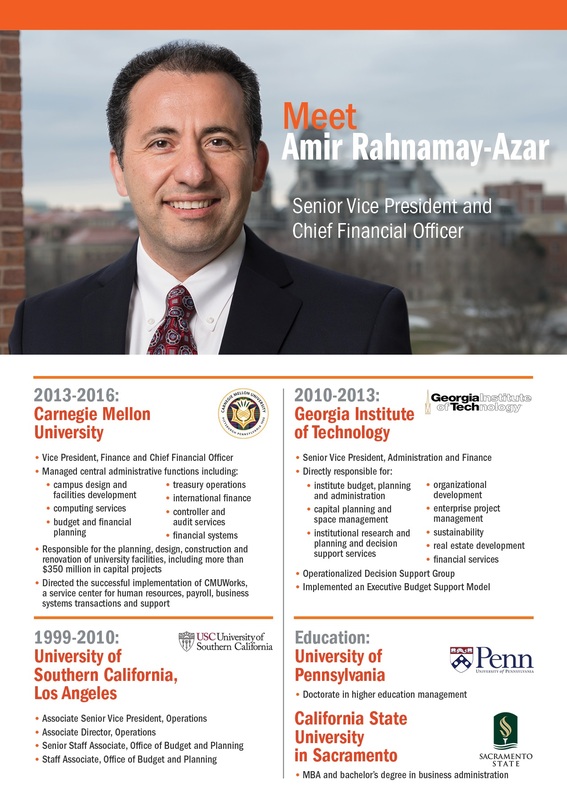 Prior to his tenure at Carnegie Mellon, Rahnamay-Azar served as Senior Vice President for Administration and Finance at Georgia Institute of Technology. In this role, he was responsible for institutional budget planning and administration; capital planning and space management; institutional research planning; organizational development; enterprise project management; sustainability; real estate development; and financial services. While at Georgia Tech, Rahnamay-Azar operationalized a decision support group and implemented an executive budget support model—two significant initiatives that improved the strategic direction, efficacy and efficiency of the Office of Administration and Finance. Before joining Georgia Tech, Rahnamay-Azar spent more than a decade working in a number of leadership and financial positions, including as Associate Senior Vice President of Operations, at the University of Southern California (USC). In this role, he served as Chief Financial and Operating Officer for the Office of Senior Vice President for Administration, where he was directly responsible for overseeing budget formulation, annual financial performance, information technology and space planning. Prior to his appointment as Associate Senior Vice President, Rahnamay-Azar served in various positions, including Associate Director of Operations; Senior Staff Associate in the Office of Budget and Planning; and Staff Associate in the Office of Budget and Planning. In partnership with Korn Ferry, members of the search committee reviewed a diversely talented slate of applicants. Search committee members included: Steven Barnes ’82, chairman, Board of Trustees; Candace Campbell Jackson, Senior Vice President and Chief of Staff; Can Isik, Senior Associate Dean and Professor in the College of Engineering and Computer Science; Edward Pettinella ’76, University Trustee and Chair of the Board of Trustees’ Budget Committee; Michael Tick, Dean, College of Visual and Performing Arts; and Michele Wheatly, Vice Chancellor and Provost. 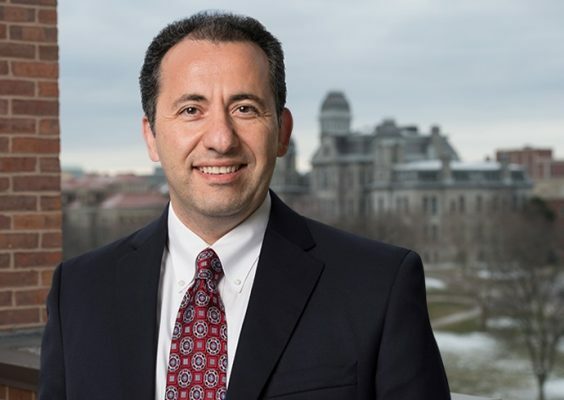 In his new role at Syracuse University, Rahnamay-Azar will oversee treasury and university investments, finance and comptroller, planning & budget, facilities, campus services, auxiliary services and risk management. He will also provide administrative guidance to the Director of Internal Audit and work in partnership with the Chancellor and the Chancellor’s Executive Team in the allocation and oversight of the University’s operating budget.